Jack Harrison celebrates scoring the equaliser for Leeds against Millwall. 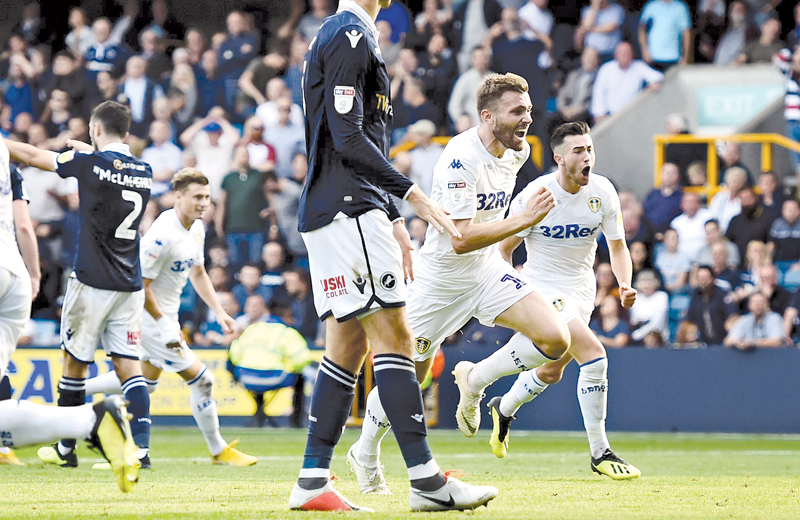 LONDON, Saturday: Jack Harrison scored a late equaliser as Championship leaders Leeds United maintained their unbeaten start to the English second-tier season with a gruelling 1-1 draw away to Millwall on Saturday. Jed Wallace gave south London side Millwall the lead 10 minutes into the second half with an effort that went in off the woodwork at the New Den after he got on the end of a flick-on from Jake Cooper. But Harrison, on loan from Premier League champions Manchester City, equalised with a low shot into the bottom corner with a minute left on the clock. Millwall could still have snatched victory but a stoppage-time header from Tom Elliott hit the inside of the post without crossing the line. Middlesbrough kicked off the day in second place but suffered their first defeat of the season when going down 1-0 away to Norwich City, with Finland’s Teemu Pukki scoring the only goal of the game in the 58th minute at Carrow Road. It was the first goal Boro had conceded in 561 minutes of league football. 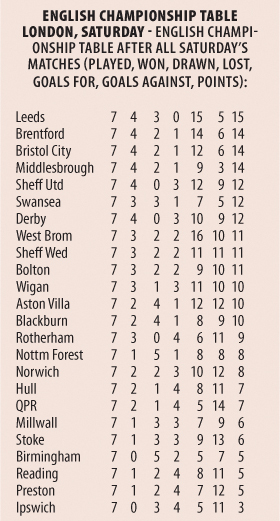 Brentford capitalised on their defeat to move up into second with a 2-0 win at home to 10-man Wigan. Neal Maupay scored his sixth goal in as many games when he got on the end of Said Benrahma’s cross in the 24th minute. Wigan’s Sam Morsy was sent off in the 58th minute at Griffin Park following a clash of heads with Yoann Barbet, who played a key role in west London club Brentford’s second goal when his shot was blocked on the line before Maupay doubled his and the Bees’ tally by slamming home the rebound in the 63rd minute. Bristol City went third, with Marley Watkins’s header nine minutes from time securing a 1-0 win over Sheffield United at Ashton Gate. Elsewhere, Derby County manager Frank Lampard was sent to the stands as the Rams’ three-game winning run ended with a 1-0 defeat away to Rotherham. Derby’s Tom Lawrence was sent off for a foul on Richard Towell in the 58th minute and five minutes later the Millers made their man advantage count when Ryan Manning scored from the penalty spot after Kyle Vassell was ruled to have been fouled. Former Chelsea and England midfielder Lampard then saw red as his frustrations boiled over at New York Stadium. Swansea went sixth after a goalless draw at home to Nottingham Forest, while QPR made it three wins in a row as they won 2-1 at Bolton, who avoided administration earlier this week. Luke Freeman and Eberechi Eze scored for Rangers before Josh Magennis pulled a goal back for Bolton.